The work of Chelsea Against the War continues with monthly meetings and events. For more information about Chelsea Uniting Against the War, contact us on FaceBook at ChelseaUnitingAgaistthe War (note there is an “n”missing) or chelseauniting@gmail.com or 617-884-5132. Super Bowl champion St. Mary’s High School football team, and most recently, for the Women’s Football Alliance national champion Boston Renegades. Chelsea High School Director of Athletics Amanda Alpert was a player on the Renegades’ professional football team, so she witnessed first hand the highly skilled coaching techniques and winning attitude that Chau brought to the field each day. Alpert has appointed Chau as the new head football coach at Chelsea High School. He was the defensive coordinator for the Red Devils last year. Chau succeeds Jack Halas at the helm of the program and joins a group of CHS head coaches that includes such familiar names as Henry McCarthy, Anthony “Chubby” Tiro, Todd Flaherty, Bobby Fee, Anthony Cardarelli, Robert Tiro, Joe Gaff, and many others. Chau, 37, is a 1999 graduate of Lynn Classical High School where he played football. He went on to play college football at Mount Ida. He is excited to take over a high school program as its head coach for the first time in his career. He had served one season as a head coach of the Southern New Hampshire Beavers semi-professional team. 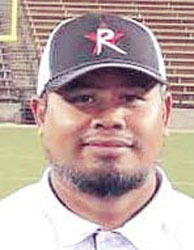 Chau has selected Joseph Solomon as the team’s offensive coordinator, along with assistant coaches Richard Wilson, David Roque, and Steph Jeffers, who like Alpert, is a women’s professional football player for the Renegades. Mike Lopez has been named as equipment manager. Chelsea will compete in the Division 8 Commonwealth Athletic Conference Small Division. Non-league opponents are Nashoba Valley, Whittier Tech, Greater Lowell, and Pope John (Thanksgiving game). With the Chelsea High School football field being rebuilt, the Red Devils will play almost all of their games on the road this season. Chau said he has already introduced himself to the coaches in Chelsea’s two youth football organizations, Chelsea Pop Warner and Chelsea Pride. Sen. Sal DiDomenico recently joined with Reps. Daniel Ryan and RoseLee Vincent to congratulate Roseann Bongiovanni on being recognized as an Unsung Heroine by the Massachusetts Commission on the Status of Women (MCSW). Each year the MCSW recognizes women across the Commonwealth who make outstanding, yet perhaps unnoted, contributions to their communities. Sen. DiDomenico and Representative Ryan nominated Bongiovanni, the executive director of the Chelsea-based environmental justice organization GreenRoots, for her efforts over the past 21 years to improve environmental conditions and quality of life in Chelsea. On June 20 Bongiovanni was honored at the MCSW’s Unsung Heroines Celebration at the State House. The Board, staff and members of GreenRoots were happy to hear the leader of their organization was getting credit for her years of work. On May 21, officers were dispatched to Jefferson Avenue for a female party reporting that a male party followed her home and was still outside of her residence. Officers met with the reporting party, who stated that a male followed her home and grabbed her arm at one point to try to talk to her. She refused his advances and told him to leave, but he continued following her to her home. The victim identified the male leaning against a fence on her property. He was placed under arrest. Lucio Ayala Rodriguez, 33, of Revere, was charged with criminal harassment and assault and battery. On May 24, members of the Chelsea Police Drug Unit executed a search warrant at 148 Park St. #4. The search warrant was the result of an investigation of a male subject for the Distribution of Crack Cocaine. Also assisting was Everett Police drug detectives. Hector Sanchez-Balestier, 34, of 148 Park St., was charged with possession to distribute Class B drugs. Every country has a story about the strength of its women. That was the lesson learned by the 30 or so young mothers who attended Roca Chelsea’s International Women’s Day celebration on March 29. Roca’s Young Mothers program focuses on helping high risk young moms get out of violence and poverty, go to work, and care for their children. As part of the programming, Roca has built a community among the participating women through a weekly ‘family night,’ where moms and their children gather to take classes, learn, and grow – and also eat and socialize in a safe environment. The International Women’s Day festivity was an add on to this weekly gathering, giving the group a chance to learn about each other’s home countries and the women that helped shape history. Ahead of the event, each participating young mom was asked to research a woman in history from her home country, and prepare a short presentation for the group. The result was a diverse line up of rock star women from all over, including Honduras, Guatemala, Puerto Rico, and the US. And celebrate they did. The women also brought traditional dishes from their home country to share with the group making the event a feast! Jeanette (Weiner) Lee, of Wayland, formerly of Chelsea, matriarch of a longtime and well-known Chelsea family and a, died on January 23, 2018. She was the beloved wife of the late Charles L. Lee. and the devoted and loving mother of Donald Charles Lee and wife Nancy of Holbrook, JoAnne D. Lee-Nieves and husband Carlos Juan of Mattapan, Michele L. (Lee) LaCosta and husband Charles of Holbrook and Brian R. Lee and wife Jodi Pages-Lee of Wayland. She was the loving daughter of the late Morris Paul Weiner and Anne (Babner) Weiner. 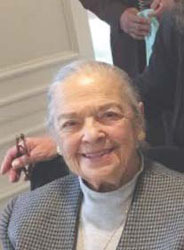 She was the dear sister of Esther Wexler of Norton, Irving D. Weiner of Norton, and the late Lily Celata, Evelyn Sweeney and Rae Cummings. She was the loving grandmother of 12 and great-grandmother of 3. Mrs. Lee was born and raised in Chelsea and educated in the Chelsea School System. In her later years, Jeanette influenced and impacted many young lives in Chelsea. She taught Sunday school at the People’s Baptist Church Chelsea for 25 years. She was the Past President of the PTA at the Williams School, Chelsea, Secretary of the Women’s’ Progressive Club in Everett, a member of the Wayland Women’s Club, Secretary of the Greater Boston Baptist Association, Secretary of the Sister International and most recently a member of the Women’s Ministry of Ebenezer Baptist Church but her greatest love of all time was her family. Mrs. Lee regularly attended her children’s school activities and took considerable pride in their accomplishments on the athletic field and in the classroom. Throughout their lives, the Lee children exhibited the kindness, generosity, warmth, and personable manner of their parents, reaching out to those less fortunate and mentoring young people through their exemplary actions and uplifting words. The Lee family was admired in Chelsea. Longtime Chelsea softball fans will fondly remember Mrs. Lee’s husband, the late Charles Lee, who made umpiring in the Chelsea Fast Pitch Softball League a work of art. Players, coaches, and fans admired the charismatic umpire who called balls and strikes with aplomb and grace and was always impeccably dressed in his official uniform. Mr. Lee sponsored the Charles Lee Disposal team in the Chelsea Men’s Basketball League, reuniting Donald Lee with his former high school teammates, including his cousin, Leo Robinson, Bobby Long, Dale Johnson and Donald Wolcott. Joanne Lee-Nieves became a highly successful women’s basketball coach, receiving state Hall of Fame honors. She was a role model to the inner-city women whom she coached and mentored. The city of Chelsea has lost a wonderful woman who brought much love and joy to her proud family and to all who had the honor of being in her company. A Funeral Service will be at the Torf Funeral Chapel, 151 Washington Avenue, Cary Sq, Chelsea on Monday, January 29th at 11AM. Relatives and friends invited to attend. Interment in North Cemetery, Wayland. A Memorial Service will be held in Jeanette’s honor on Saturday, February 3rd at 11AM in the Ebenezer Baptist Church-157 West Springfield St., South End, Boston, MA. In lieu of flowers donations in Jeanette’s memory may be made to the Animal Rescue League of Boston-10 Chandler St., Boston, MA 02116 or to the American Kidney Fund-11921 Rockville Pike, Suite 300, Rockville, MD 20852. Visit www.torffuneralservice.com for guestbook and directions. Last week, the Massachusetts Legislature passed the Pregnant Workers Fairness Act, which guarantees reasonable accommodations and safety measures for pregnant workers. Senator Sal DiDomenico and Representative Joseph McGonagle both voted in support of this legislation that makes it illegal for an employer to discriminate against, refuse to employ, or terminate an individual due to pregnancy or a condition related to pregnancy. Reasonable accommodations may include time off to recover from childbirth; more frequent, longer paid or unpaid breaks; procuring or modifying equipment or seating; obtaining temporary transfer, job restructuring, or lighter duty; and private non-bathroom space for expressing breast milk, among others. Refusing to hire a person who is pregnant because of the pregnancy or because of a condition related to the person’s pregnancy if that person can perform the essential functions of the job with a reasonable accommodation that does not impose an undue hardship on the employer. The bill directs companies to engage in a collaborative, good faith process with employees and prospective employees to determine effective and reasonable accommodations. In specific instances, employers may require documentation pertaining to the need of accommodation from appropriate health care or rehabilitation professional. This does not apply to accommodations for more frequent restroom, food or water breaks, seating, and limits on lifting over 20 pounds. The bill has an effective date of April 1, 2018. It now goes to the governor’s desk for his signature. When Chelsea Police Det. Rosie Medina reflects on why it is she became a police officer, part of her says it’s because she wanted to defy her father, but another part says it’s because she loves the community and has found perfect harmony in her job where she can help the community and do something she loves. Det. Medina has been on the force for nearly 25 years and last Thursday, the Massachusetts Association of Women in Law Enforcement honored her during their annual awards ceremony in Yarmouth. Medina was given the association’s Community Service Award for 2016. Massachusetts State Police Colonel Richard McKeon served as Guest Speaker at the event and said women are important to law enforcement. “What they bring to the table from investigations and all aspects of what we do, they’re just an integral part of law enforcement,” said McKeon. Back in Chelsea, Medina sat down with the Record and said she loved building bridges between the community and the police department. Medina said her work in the community, which includes investigating domestic violence cases and working with the Chelsea Collaborative’s Summer Youth Employment Program. In being involved in those pursuits, she said she has gotten important tips for crimes – simply due to the fact that people have come to respect and trust her. Chief Brian Kyes said Medina has always understood the importance of the police and the community working as one. However, that path of policing was nearly thwarted, Medina said. First of all, her father didn’t like the idea and, at first, of a woman being a police officer. Meanwhile, other obstacles also got in her way. After seeing other women come onto the Chelsea Police and being encouraged to take the test, it took Medina three callbacks to actually get to the Department. After being called the first time, she was sent packing because they told her she was a ½ pound over the weight limit, she said while rolling her eyes. Det. 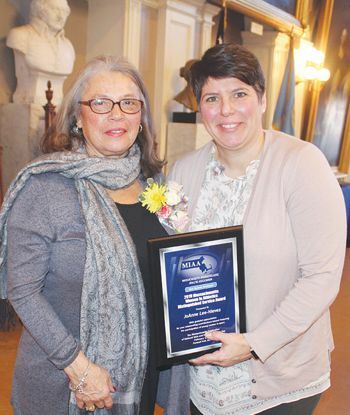 Rosie Medina of the Chelsea Police Department recently won the Massachusetts Association of Women in Law Enforcement’s Community Service Award for 2016. Medina has been on the force for nearly 25 years. The second time, her now ex-husband had forbid her to take the job – saying he wasn’t going to be left at home alone at night while she rode around in a cruiser with some other guy. However, the third time, just as she was preparing to go to law school, Medina got courage and went for it. Almost 25 years later, Medina said she has no regrets about choosing a career in law enforcement in Chelsea. Harvard is the world’s most prestigious university and its athletic program is just as awe-inspiring. The famous Ivy League institution in Cambridge is home to colleges’ largest program with 42 sports, from skiing, sailing and golf, to baseball, basketball and squash and everything in between. The Harvard-Yale football game is known simply as The Game. Tim Troville, who grew up on Webster Avenue and starred in sports in Chelsea High School, is totally immersed in Harvard sports tradition as associate director of athletics, facilities and operations. In his key post, the 37-year-old Troville oversees the maintenance, construction, and project management of the Harvard athletic facilities, along with event operations and game management. He is proud of Harvard’s position of prominence among collegiate athletics. Since Troville’s arrival, Harvard has advanced to the Women’s Frozen Four in ice hockey under coach Katey Stone. The men’s basketball team, led by coach Tommy Amaker, has won the Ivy League title and competed in the NCAA Division 1 Tournament. The Harvard football team, under coach Tim Murphy, has won three consecutive Ivy League championships. One of his best memories was when ESPN’s College Game Day came to Cambridge for the 2014 Harvard-Yale game. The son of Patrick and Karen Troville, he attended the Mary C. Burke School and the Williams School. At Chelsea High School, he became an athletic and academic superstar, setting the foundation for his current career in sports administration. After playing Little League Baseball and being coached by Ray Deleidi and his father, Patrick, he became the starting catcher as a freshman for the Chelsea High baseball team. “I came in the third inning of my first game at Chelsea High and started every game after that,” recalled Troville. Playing varsity baseball for coaches Mike Lush and Fito Ramirez, Troville was an unprecedented four-time Commonwealth Athletic Conference All-Star and MVP in his senior season. His play at catcher in high school attracted the attention of Major League baseball scouts. At 6 feet, 2 inches, he played football in his junior and senior years and helped Chelsea win its first and only Super Bowl in 1995. He also earned a spot on the varsity basketball team. “I learned so much from coaches Joe Gaff (football) and Jack Niven (baseball),” said Troville. But it was baseball that opened doors for Troville. A potent hitter with a great glove and arm, Troville set his sights on playing Division 1 baseball in college. Troville was an honor roll student who was ranked third in his graduating class. He turned down a full scholarship to Boston University and chose Northeastern University. He became Northeastern’s starting catcher, He played in the Beanpot at Fenway Park and was a teammate of Carlos Pena, a No. 1 draft pick of the Texas Rangers. Troville graduated from Northeastern with a degree in Communications and took a job as assistant baseball coach at his alma mater. He also worked in athletic administration and event management at the university. Troville moved on to Indiana State University where he took an assistant athletic director’s position. He worked at ISU until 2008 when he became assistant athletic director of operations, facilities and event management at Tufts University in Medford. He worked at Tufts until 2013 when he received a job offer from Harvard. Tim Troville (left), associate director of athletics at Harvard, is pictured with Tim Murphy, head football coach, at the university’s athletic complex in Cambridge. nielle, and their two sons, Timothy, 3, and Donovan, 1, will be back at his alma mater in Chelsea on May 26. CHS director of athletic Frank DePatto invited Troville to be the guest speaker at the annual awards night program.